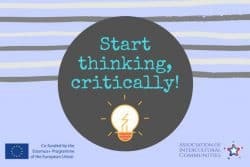 Press release ‘Start thinking, critically! The Association of Intercultural Communities with partners from three countries: Bulgaria, Greece and Poland are preparing to carry out the project called “Start thinking, critically!” in Hidiselu de Sus, Bihor County. This project was funded by the European Commission through the Erasmus + Program, Key Action 1: Youth Mobility Project. The main theme of the project is media literacy and critical thinking. The project group includes a total of 28 participants aged 18-26. Throughout the project, participants will acquire knowledge about media-related concepts, media structure, by learning how to deconstruct media messages, learning about the specificity of each type of media (press, television / radio, commercials, social media), by developing the skills to create their own video materials and by exercising critical thinking skills. The objective of the youth exchange is to increase the media literacy knowledge of the participants through a non-formal learning process. To achieve the objectives of the project, the program includes activities such as: creative workshops, interactive presentations, situation games, non-formal games, debates, case studies, study visit, media creation, meeting with the local community, intercultural evenings. – Raising the participant’s level of knowledge about the structure, basic concepts of the media, deconstruction of messages and media contents. – Developing the participant’s practical skills of critical thinking as an important element of democracy. – Improving the skills of the participants to create media content. – Raising awareness of 100 young people in Oradea about the importance of media literacy and critical thinking by participants. – Exploring the possibilities offered by the Erasmus + program among participants.